An Island in Ölfus is the title of an exhibition by Valdimar Thorlacius. The title refers to a town in southern Iceland which lies in an active geothermal area. The town is also the photographer‘s home town, so it has a special meaning for him as a subject. Hot water wells up from the earth in a constant flow in the middle of the town. It may flow calmly for a while, predictably even, until it gushes forward forceful, loud and unpredictable. The landscape is interesting, characterized by colourful rock formations, sulphur, deposits, hovering clouds of steam and mysterious holes in the ground.The community does not have a long history; it was first documented around 1700 AD in the Fitjar Annals which recount the change in geothermal activity following the great earthquake 1597. Constant change is truly the nature of active geothermal areas. The geothermal zone, right in the middle of town, is quiet for now, much like a dormant beast. The people of Hveragerði live with the knowledge that one day that beast may awake and flex its muscles. Until 1902 the hot springs and hot water in Hveragerði were used by the inhabitants to do laundry, for bathing and boiling food. Around that time people became increasingly interested in harnessing geothermal heat to create jobs. In the following years one building after another appeared around the geothermal area, drawn to the warmth in the ground. The swimming pool in Laugaskarð, built in 1938, was for many years the longest swimming pool in Iceland. In due course the geothermal mud of the hot springs started to be used for health treatments and in 1950 the National Hospital, Landspítalinn, opened a facility for mud baths in the geothermal area. Shortly after that the Icelandic NAture Health Society NLFÍ, founded a sanitorium in Hveragerði. Hveragerði owes its existence to geothermal heat. A handful of pioneers saw the opportunities this resource presented ,and thankfully had both the brains and diligence to make something out of them. The people who live here today may not have the energy in the midst in their everyday thoughts, however it is part of their lives. For better and for worse. The houses are either built close to or on top of rifts in the earth or hot springs. They have been damaged in earthquakes and new hot springs have even found their way through rifts in the rocks to bubble up inside houses. 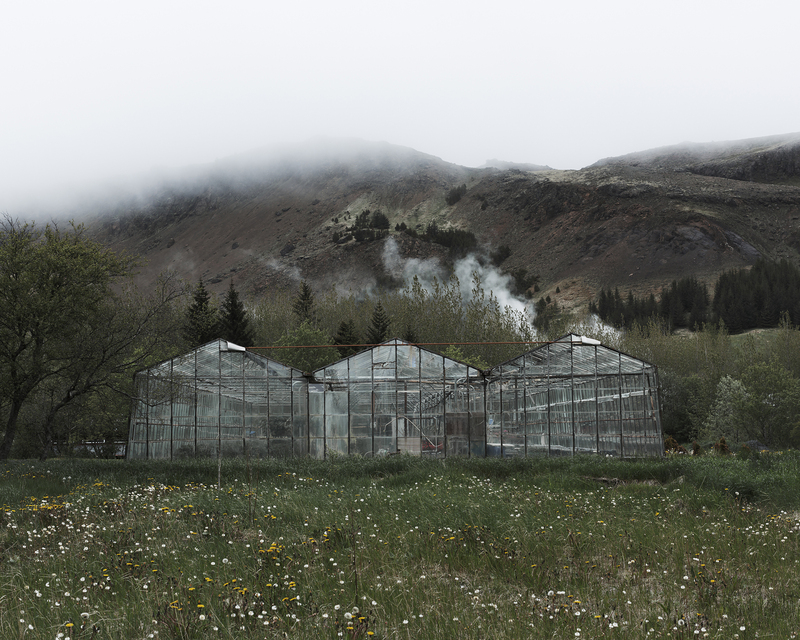 In his work, Valdimar Thorlacius explores the town of Hveragerði and its people, among the hot springs, clouds of steam and greenhouses. Valdimar Thorlacius graduated from the School of Photography in Reykjavík in 2014. That same year he was awarded a grant from the Magnús Ólafsson Memorial Fund, and published a photography book. In 2015 he participated in the group exhibition Warsaw Festival of Art Photography at Galeria Obok ZPAF in Warsaw, Poland and had a solo exhibition in the National Museum of Iceland.